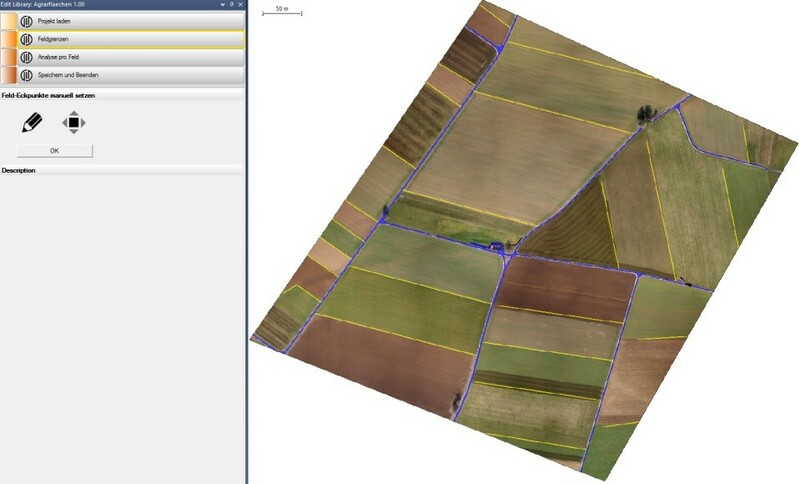 Growing use of imagery from aerial campaigns with UAV offers farmers and agronomists the chance to get easy access to individual relevant information out of a large amount of high qualitiy imagery. To prepare such information Tama Group and GerMAP introduce new applications to enable users to extract exactly this part of information, which is actually the most valuable in a smooth and interactive way. After acquiring the imagery by a UAC campaign and processing it to a orthomosaic with a dense surface model behind, the automated processes recognize farm tracks. Now the user is asked to select field corners by means of an intuitive user interface and a small number of tools. The software then derives field boundaries automatically and thus establishes selected fields or plots as single objects. Now the software provides serveral applications to extract detailed information about single fields or plots. You may choose a field and make the software detect irregular growth patterns of crops or suspected fungal attacks. In addition to one-time analysis, our set-up allows for monitoring and analysis over defined periods of time, for example to capture revealing changes of field or crop properties. Output formats could be geo-coordinates, georeferenced image snippets or tables, describing the detected area of interest.